Enjoy authentic French cuisine on the patio steps of Paris Las Vegas. Mon Ami Gabi is one of the strip's most noticeable landmark venues and home to one of the best eatery-scenery restaurants in the world. As you enter the restaurant you will not help but want to learn how to speak French. The comfortable tapestry, dark wood surroundings and French speaking employees, will have your senses begging for a taste of their French cuisine. Mon Ami Gabi features a great selection of authentic dishes both lunch and dinner. 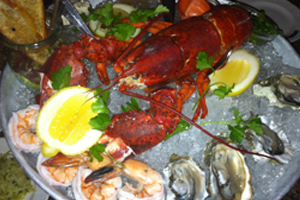 Start off with a taste of their salmon platter or a plate of their fresh oysters. The wine list is one of the most extensive in the city, and the staff is well educated, so don't be afraid to ask. Their main dishes could vary from juicy steaks, to fresh seafood. Don't leave without getting a taste of their Chilean sea bass, served with vegetables herbed with a butter garlic sauce. Please make sure you save some room for one of their phenomenal desserts. Mon Ami Gabi, is a great place to have a nice lunch while 'people watching' on the Las Vegas strip or to enjoy a romantic dinner under the lights.